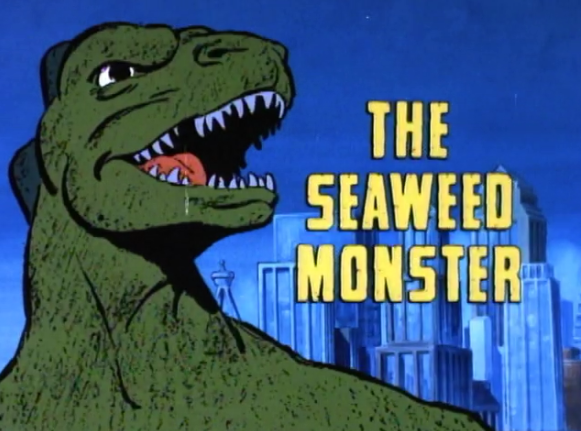 John Kenneth Muir's Reflections on Cult Movies and Classic TV: Saturday Morning Cult-TV Blogging: Godzilla (1978): "The Seaweed Monster"
Saturday Morning Cult-TV Blogging: Godzilla (1978): "The Seaweed Monster"
This week on Hanna-Barbera’s Godzilla (1978), the Calico travels to the Sargasso Sea. But even he couldn’t have anticipated that beneath the waves a giant, malevolent sea monster lurks. But before long, Quinn’s samples of sea-weed on the Calico begin growing as well. Quinn determines that only the heat of sunlight can dry them up these monstrous specimens and destroy the beasts. Now Godzilla must get the monsters to the heat of a nearby island to let the sun do its job. 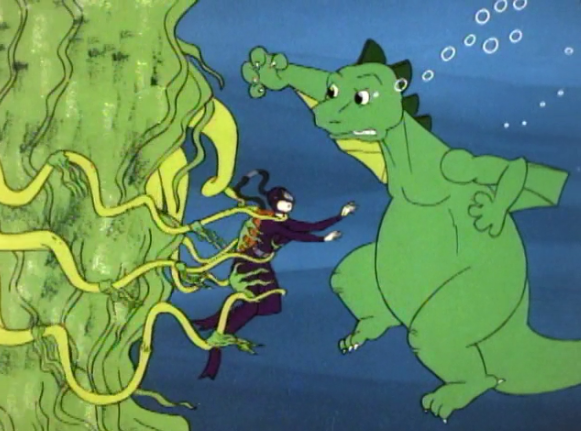 “The Seaweed Monster” is a fun episode of Godzilla, though there are some major gaps in logic here to consider too. First, sea-weed can be burned up by any number of means, and there is no reason to depend solely on the light of the sun. 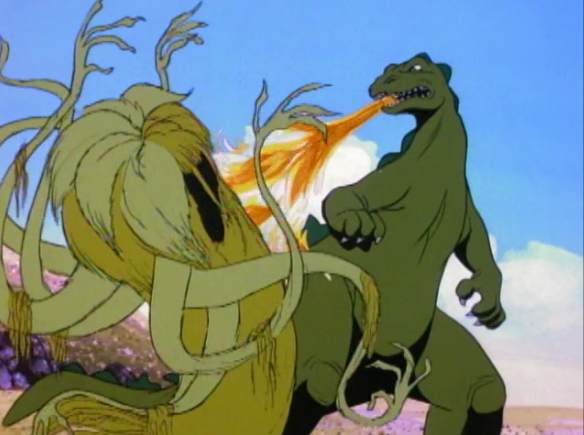 Godzilla’s atomic fire-breath is a perfectly adequate weapon, and indeed, he uses it in the episode’s final frames to burn up one of the monsters. 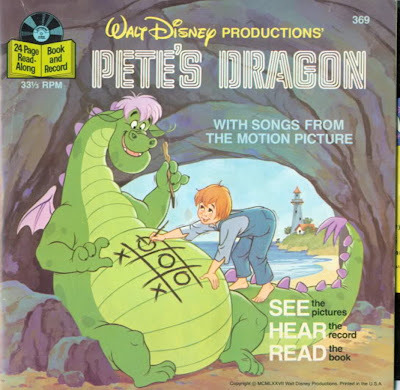 This is a solution that any fan of Godzilla (and any kid paying attention…) would like hit upon almost immediately, so it’s baffling that it takes Quinn and the others nearly twenty-two minutes to come up with it. Secondly, Godzilla must laboriously drag one of the Seaweed monsters -- on his back no less -- to a nearby island, where the sun is apparently hotter. Now, I would understand this idea if the island were far away, near the Arctic or Antarctic, for instance. But this island is within walking distance for Godzilla. So is it really that much hotter there that it would make a difference in terms of burning the creature up? 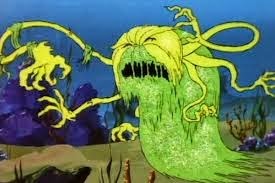 Outside these issues, there is a degree of tension in “The Seaweed Monster” that makes it a lot of fun. The seaweed monster keeps adding mass, as more seaweed joins with it, and even after dispersed, more seaweed can come together rejoin, and produce another monster. “Some instinct is making the seaweed assemble into one giant mass,” a character notes, and that may not be a very good scientific explanation, but it makes for an enemy that is harder to pin down, and more difficult to permanently defeat. The scenes in which the divers are pursued by the monster, and it grips them with ever-more tendrils are actually pretty effective and suspenseful. 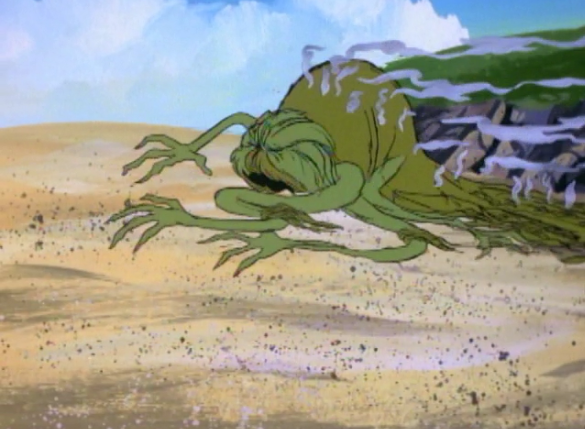 That fact established, you’ve just got to feel sorry for the last seaweed monster as it crawls away, dried up in the sun, and is pursued by Godzilla. We don’t ever really learn why it is so hostile, and it is kind of pathetic in this final form.